Combine marinade ingredients in a food processor or blender and process to a paste. Spread over the grouper fillets and let rest for at least 1 hour. heat a pan with the oil until it begins to smoke. Add the fish skin side down; saute until it browns, 2-3 minutes, then turn over and brown other side for 1 minute. Finish in oven if necessary. Chef: gorgeously cooked fish; cooked all the way through and nice browning on the outside, well salted, but not overdone, lemon zest on top looks nice since there is no sauce for the fish. 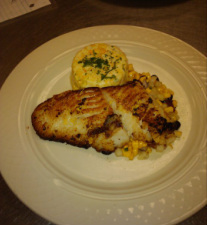 Personal/Team: Fish looked really nice; it was hard to pan-sear because it is so delicate. most pieces fell apart, but we were able to get one nice piece for presentation. Lessons Learned: this is a tricky fish to cook; it doesn't have a lot of flavor, so marination helps, but that makes the fish breakdown further and more likely to fall apart. Just being careful and using a good saute pan and fish spatula. Also, seasoning after cooking is helpful because the marinade doesn't offer that much flavor.